As we get ready to kick off our second year, we have a few changes to announce before our first event next Wednesday. 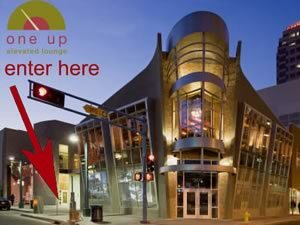 All of our events this year will be held at One Up Elevated Lounge, which is downtown at 301 Central NW on the 2nd floor. The room we are using is immediately to the left of the front door to the lounge on the second floor. If you hit the bar, you've gone too far. Street parking is free after 6pm, and that's what we recommend. However, if you can't find a nearby spot, we've worked out a deal with the owner of the parking lot between 3rd and 2nd, across from Gold Street Cafe. The owner has agreed to a $1/hour rate for Webuquerque attendees. 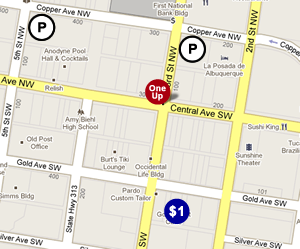 You can also park in the nearby parking garages at 3rd and Copper and 5th and Copper, both of which have hourly rates. We have updated our registration/RSVP policy. Please refer to the new information for future events. Our new venue has an occupancy max of 40 people, so we are going to be limiting attendance to 40 attendees this year. As such, it is more important than ever that you RSVP for our events. For each event, we will have a list of the first 40 people who RSVPed (on Upcoming, Facebook or Duke City Fix) and will check names at the door. If you did not RSVP, you will only be allowed to attend if 1) we have less than 40 people or 2) one of the 40 who RSVPed is a no-show. If you RSVP and do not show up three times during the course of the year, your name will be moved to the bottom of all future attendance lists and we cannot guarantee your seat. Just like last year, we will be raffling Adobe software mid-year (likely June). However, this year, we really want to reward our regular attendees. So, we will be saving door prize tickets from all events and using those to select the software winner. When you arrive at our events, we ask that you sign in and provide an email address. We will then give you a raffle ticket for that evening's door prizes. You will keep half (so you know your number) and you will write your name on the other half, which we will keep for the door prize raffle and our mid-year software drawing. We hope these changes will make Webuquerque an even better experience for our attendees. If you have any questions or concerns, please don't hesitate to let us know.